You’ve decided to have a sunroom installed so you can enjoy the extra space and natural lighting in your West Texas home. Next comes the fun part: designing the space. Whether it’s a matter of decorating or developing the setup of your sunroom as a whole, you can begin searching for inspiration for the design of your sunroom now. Fortunately if you’re struggling to think of ideas, there are many resources available to homeowners. Here are a few ways to start getting the juices flowing. If you’re at a loss for how to design your sunroom, consider the design of the rest of your home. Are there any themes running throughout? Are you drawn to the colors and shape of mid-century modern, or does your home have more of a shabby chic elegance? Do you use warm, cozy colors, or cool, airy colors? 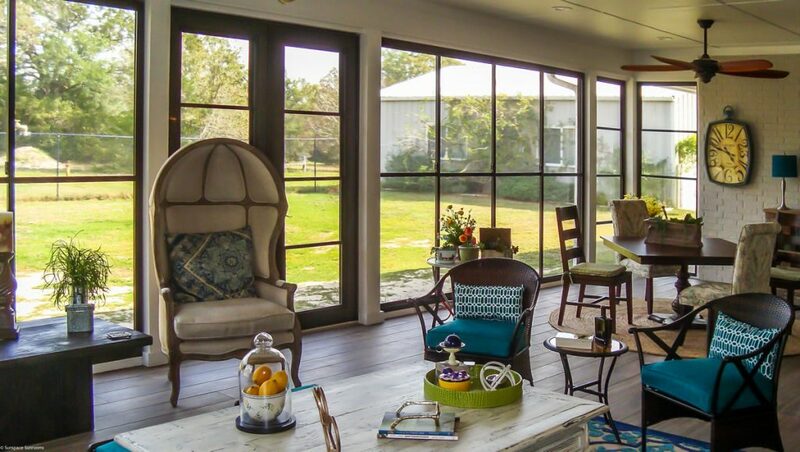 Through the right design, your sunroom can flow more cohesively into the rest of the home. You should also think of what the home lacks that can be added to a sunroom, such as a cozy breakfast nook or a fun-filled game room. You should also consider the outdoor views surrounding the sunroom, as these might inspire your design as well. 20 or so years ago, the common thing to do would be to seek out interior design magazines or catalogues and browse through the pictures, dog-earing the pages with designs that spoke to you. You might create a scrapbook or just make a few cutouts and go from there. Even in the past 10 years, it might be more common to search Google for sunroom design ideas, and that’s certainly an option. However, even more common these days is Pinterest. This social media platform is designed to allow you to make “pinterest boards” full of pictures and links for inspiration on a variety of themes — like interior design. There are thousands of results when you search sunroom design on pinterest. You can mirror your design on one of the results you find, or create a plan based on a few different results. Planning your sunroom design before the sunroom is installed? If it comes to the room’s layout or the particular kind of sunroom you want, consider talking to your sunroom installation company. They may have a gallery showing images of their past sunrooms. Take a look through it and point out the images that speak to you. Your sunroom company should be able to take a look at the aesthetic you like and the set-up of your home and tell you what they can do for you. You can also discuss different types of sunrooms with them and the kinds of windows and screens that work best for what you want. Designing your sunroom can be the fun part of the project. You just have to know where to find inspiration. In the meantime, though, you’ll want to find a trustworthy sunroom company. Contact Sunspace Texas today for more information.